The European Parliament Working Group on Antisemitism (WGAS), held an event at the European Parliament to discuss the importance of building bridges through cooperation and dialogue as opposed to destructive and counterproductive calls for boycotts, namely by the Boycott, Divestment, Sanctions Movement (BDS). The event, which was titled “Culture and Education: Bridges, not Boycotts”, consisted of a panel discussion featuring WGAS Chair MEP Heinz Becker (EPP, Austria), Vice-Chairs MEPs Juan Fernando López Aguilar (S&D, Spain) and Helga Trüpel (Greens/Germany), as well as Kim Robin Stoller, Co-Director of the International Institute for Education and Research on Antisemitism (IIBSA), and Robbie Young, Vice-President of the UK’s National Union of Students (NUS). In his opening remarks, MEP Becker highlighted the problematic elements within the BDS movement, which fall under the IHRA working definition of antisemitism: “The BDS movement systematically uses antisemitic imagery and messages whilst claiming to engage in criticism of Israel, it compares current Israeli policy to the Nazis, glorifies convicted murderers and questions the right of self-determination of the Jewish people.” As such, the activities of BDS and the effects thereof on European Jewish communities are of great concern to the Working Group. “Given that the BDS movement boycotts academics and artists and targets students, this movement stands against the European ideal of exchange through dialogue”. Student activist Robbie Young presented the important and troubling findings of a survey he conducted with the NUS internal research team on the experience of Jewish students on campus. According to the survey, half of Jewish students in the UK do not feel comfortable talking about the Israeli-Palestinian conflict on campus. Furthermore, 68 percent of Jewish students do not feel comfortable with BDS policies on campus and found these to be a deterrent to getting involved in a student union. This has had the consequence of many Jewish students losing faith in their student unions as a partner against antisemitism. Through his important research and his advocacy on behalf of fairness and inclusion, Robbie Young is widely regarded as a principled and courageous ally of Jewish students in the UK. For his part, Kim Robin Stoller, who is an expert on antisemitism and BDS, outlined the origins of the movement and other similar efforts to boycott Jews and Jewish statehood. Calls of boycotts and actual boycotts against Jews have a long antisemitic history. These include attempts to boycott the pre-State Yishuv in the 1920s, as well as the “anti-normalisation campaigns” conducted by Arab League states. All of these movements are based on a paradigm that singles out Jews for exclusion and shares the themes of delegitimisation, demonisation and double standards against the Jewish people. 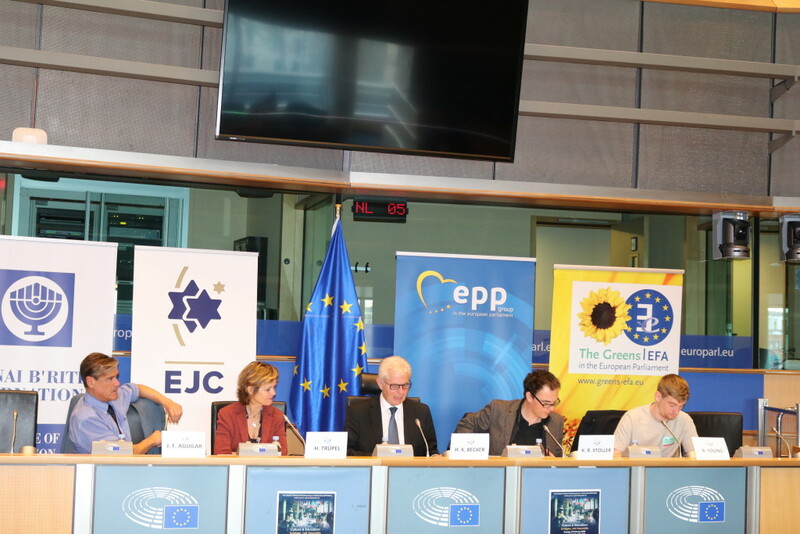 The event took place one day before one of the founders of the BDS movement, Omar Barghouti was due to speak in the European Parliament, a decision condemned by EJC and other Jewish organisations. The panel discussion was followed by a thought-provoking Q&A session which included testimonies of Jewish students who had personally been victims of harassment and intimidation by BDS activists. In addition, several MEPs present in the audience contributed to the discussion. Recalling a conversation with Rabbi Michael Melchior, Cecilia Wikström MEP (ALDE/Sweden) stressed the importance of dialogue as a pathway to peace: “You do not make peace with your friends, you make peace with your enemies”.